The Galaxy Alpha features a 6.7mm wide metal frame flanked by a 4.7-inch Super AMOLED display and pleasantly-textured back panel. But just how easy is it to take apart? First off, the Galaxy Alpha comes with a removable rear panel, which means that the device gets extra points for having a user-replaceable battery – almost a must considering the rather low 1,860mAh capacity. Beyond that the iFixit team found a fair amount of adhesive holding its ultra-thin display panel together, which takes a considerable amount of heat and prying to remove. 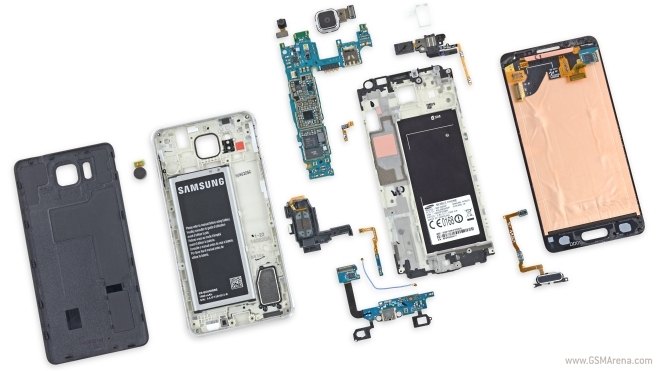 Although the remaining components are modular and can be removed easily, getting to them requires getting through the difficult display assembly, which ultimately resulted in a repairability score of 5/10. Another interesting tidbit is the presence of a gasket around the headphone jack, which indicates that waterproofing may have been part of the initial design. Hopefully the Galaxy Alpha 2 will go all the way with that! For our own full take on the Samsung Galaxy Alpha, check out our comprehensive review.